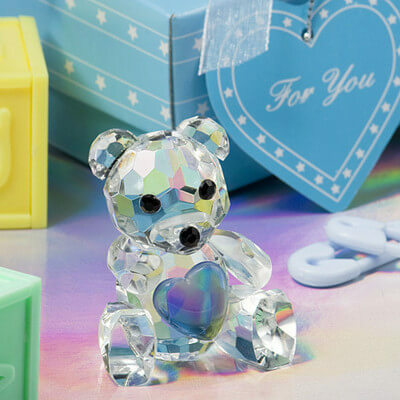 Give your guests a heartwarming and long lasting smile with these adorable crystal blue teddy bear favours from Favour Perfect’s Choice Crystal Collection. 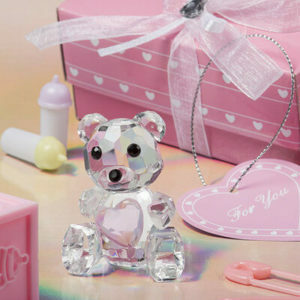 Each measures approximately 5cm x 3cm in the shape of a glistening multifaceted crystal teddy bear, with black eyes and nose, sitting and playfully clutching a blue crystal heart in his paws. As a boys baby shower favours or favours for any of baby’s big events, these classy keepsakes make for a stunning presentation, nestled in white satin inside a blue Choice Crystal signature box, decorated with white hearts, wrapped with a white organza ribbon with a crystal heart accent on top and an attached blue heart shaped “For You” tag. Please note this product is a pre order and will take around 3 weeks to arrive.